In an automobile-happy society like the United States, where many still don’t know how battery-powered electric vehicles (EV) operate or the reasons why they exist, the debut of Hyundai Motor Co.’s latest fuel-cell vehicle (FCV) – a more advanced and complex environmental technology -- may draw limited consumer demand. But give Hyundai credit for boldly and courageously playing a long game, one that eventually could deliver the South Korean automaker big advantages if and when hydrogen-powered fuel cells become a mainstream automotive technology. The 2019 Hyundai Nexo, a handsome SUV, effectively illustrates the case for hydrogen rather than gasoline or diesel fuel – or even batteries – as a means of automotive propulsion. Nexo’s fuel cell stack converts hydrogen into electricity, with an electric motor driving the wheels. The car, like all fuel cells, emits only a bit of water vapor – making it a favorite of environmental advocates who oppose carbon dioxide and other emissions from combustion as harmful to the earth’s atmosphere. Most hydrogen filling stations are found in California, at least for the time being. Nexo goes on sale shortly in the U.S., mainly at Hyundai dealers in California, the only state where ownership of a hydrogen car is practical for the time being. (Built in South Korea, the model also will be available in that country and in Europe.) About 35 hydrogen filling stations are scattered from San Diego to San Francisco. With a state-sponsored $200 million incentive program, operators have slowly been opening hydrogen fueling points, rendering Nexo and a few other fuel-cell models like the Toyota Mirai and Honda Clarity practical for some Californians. 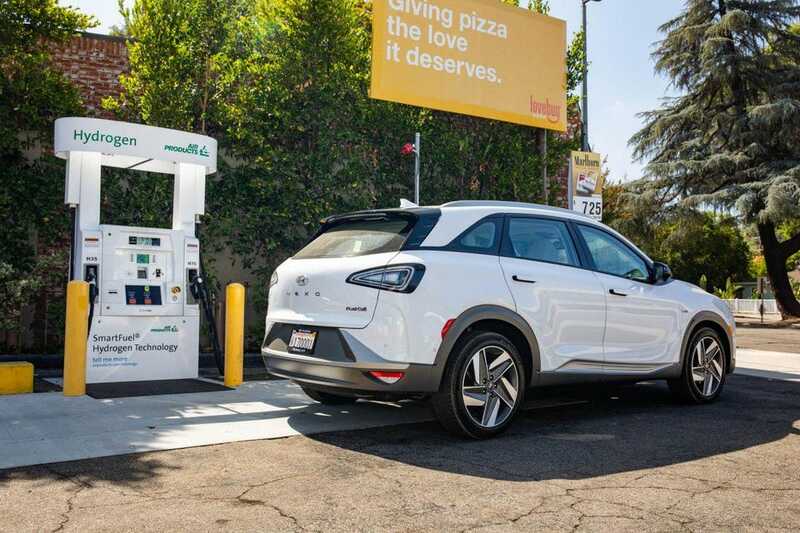 By 2020 the number of filling stations is expected to rise to 59, Hyundai estimates.